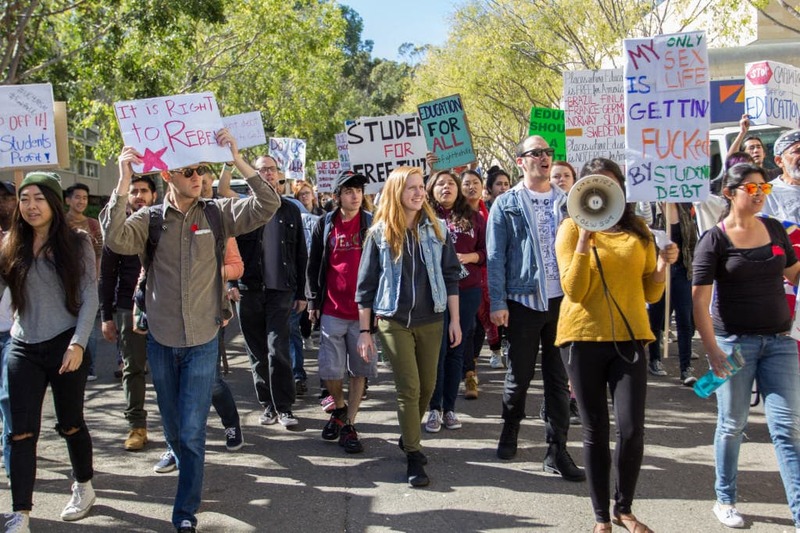 UCSD students and alumni rallied against student debt, tuition fees and wage discrimination in the nationwide Million Student March protest on campus this afternoon. Over 110 colleges across the country participated in the event, according to the national Million Student March website. The movement calls for tuition-free public education, cancellation of existing student debt and a normalized $15 minimum wage for campus employees. UC Office of the President media specialist Kate Moser told the UCSD Guardian that the University of California supports student efforts to make public education more affordable. According to its website, individuals who graduated college this past year are facing over $35,000 in student debt on average. Additionally, over 40 million American college students and graduates now collectively owe $1.2 trillion in student debt, which is more than twice as much as in 2009. A.S. Vice President of External Affairs Krystl Fabella told the Guardian that these numbers sparked a discussion about the current state of affairs regarding education. A.S. President Dominick Suvonnasupa also expressed support for the movement and said the burden of student loans needs to be addressed now more than ever. Moser commented that the UC system already strives for college affordability, but the system can still improve upon its methods. Last month, UC President Janet Napolitano implemented the first phase of her three-year Fair Work, Fair Pay plan and raised the University of California minimum wage to $13 per hour, with an eventual increase to $15. However, this wage increase will not affect student employees, who work under 20 hours a week and therefore are not eligible for the plan. Campuswide Senator Ryan Perez told the Guardian that while more students could have participated in today’s march, it was still an impressive show of solidarity for students who face these issues across the country. Thurgood Marshall College junior Esperanza Gutierrez and Million Student March participant said that the protest is the first step in implementing nationwide change. Fabella added that the organizers decided to use the march to increase student awareness about the Black Lives Matter movement due to recent incidences of racism at the University of Missouri. UC Student-Worker Union San Diego, Tritons for Bernie Sanders, 15 Now San Diego, Socialist Alternative at UCSD and Students for Free Tuition sponsored the rally at UCSD. Event organizers will be hosting a discussion at Price Center next Thursday to brainstorm future rallies and steps to raise awareness. Additional reporting by Jacky To.